Have you ever wanted to know what it’s like to fly like an eagle? 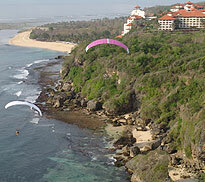 Then why not take a tandem flight, which we offer for IDR 1,400,000. 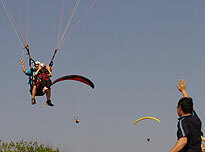 The tandem flight consists of a short instructional briefing followed by a 15 minutes flight (weather permitting). 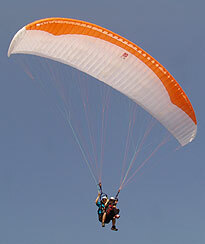 The tandem paraglider is flown by one of our fully qualified pilots. During the flight the pilot will explain to you what he is doing, and if conditions permit, allow you some hands-on control of the glider. A tandem flight is an exciting, one-off experience, however if having experienced the thrill of free flight you wish to take it further, we are able to offer you a full training. In-flight photo and video can be arranged on request. Since last year, in joining with fellow friends which member of Korea Power Glider Associate (KPGA), we had done some flying trip around costal of Bali's Island and inland... Now, we're ready to assists paramotor pilots whose in holiday in Bali. 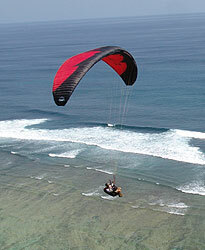 We, Bali Paragliders Club, would be pleased to organize your Paramotor Trip in Bali or anywhere else in Indonesia... You're going to discover more from the air of Bali Magical Island. 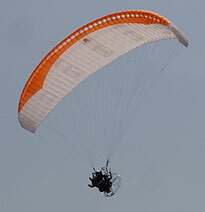 We are also run Tandem Paramotor flight for people who wish to flying without learning... Flying is won't be your dream anymore! Aerial photography or flying with company banner during any events is also our specialty. Just drop us an email or contact our club officer. 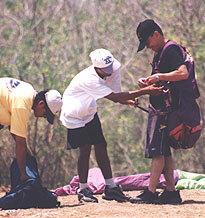 The training time before a student can fly unsupervised will depend on the individuals aptitude and weather conditions. First you have to achieve Student Pilot Rating, which takes on average 4 days. Continuing under supervision, the next step is to gain Beginner Pilot Rating, this takes a further 2 - 3 days tuition. Once you have Beginner Pilot Rating you can fly unsupervised. Remember, this is a general guide only, as a license has to be earned, by accomplishing set tasks, and passing an exam. The focus of this course is to get you into the air, once you have demonstrated control of the canopy on the ground. If you then decide you’d like to take it further, these days are credited towards Student Pilot license. This course builds on the introduction, and includes theory of flight, meteorology, air law, and aerodynamics. At the end of the course you will sit a written exam, and if successful will acquire a Student Pilot license. This license requires that you always fly under supervision. This course follows on from the Student Pilot, and upon successful completion, you will receive a Club Pilot License. The course includes rapid descent techniques, active flying. This license requires that you always fly under supervision. Generally flying season is from April through November and the best flying seasons are June, July, August, September and October. A range of services are available for visiting pilots, from packing your canopy, transportation and even an assistance to find accommodation close to the site. A Member fee of Rp. 300.000 is required for visiting pilot and can be paid either to Timbis Flying Club Bali, the PLGI (Indonesia Paragliding and Hang Gliding Association) or to other flying association throughout Indonesia and therefore, it will be accepted throughout Indonesia. Membership fee is valid for 1 month and it can be renewed. The following table lists are some of the most popular ones, with their prices. Carrying your canopy from the beach to take off. Carry your hang glider from beach to take off. (between Bali Cliff Hotel & Nikko Hotel). Transport for 8 hours (by Toyota Avanza). Transport for whole day (i.e. trip to Candidasa). The Worldwide leader in personal flight instruments for soaring and balloon pilots. Please contact us for more detailed information & consultation. 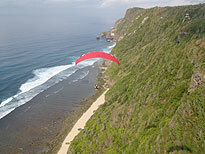 Copyright © Bali Paragliders Club. All rights reserved.